We have all heard it, and if we are lucky we have spoken the words ourselves, “that was the trip of a lifetime”. I feel very fortunate to have uttered the phrase many times in my life. I don’t think I’ve said it lightly or taken it for granted, but I know that the latest trip to Prince Edward Island to fish with Tony’s Tuna Fishing was worthy of this illustrious title. What qualifies a trip for this label? I believe it is a combination of factors that come together to make unforgettable memories. Good friends or family, amazing displays of nature, a little good weather and the hard work and hospitality of your hosts are a few of the key ingredients. All of these aspects came together in Prince Edward Island. Capt. Tony, Capt. Bradley and their crews worked tirelessly to make sure we had the best trip possible. Mother nature did her part and shared with us a tussle with some of the most majestic fish in the ocean. 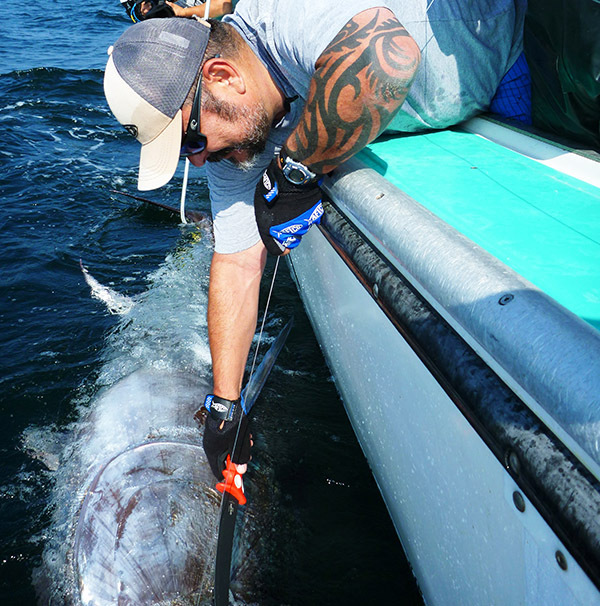 Giant bluefin tuna invade the fertile waters of PEI in the late summer and fall to fatten up on herring and mackerel, and fat is an understatement. 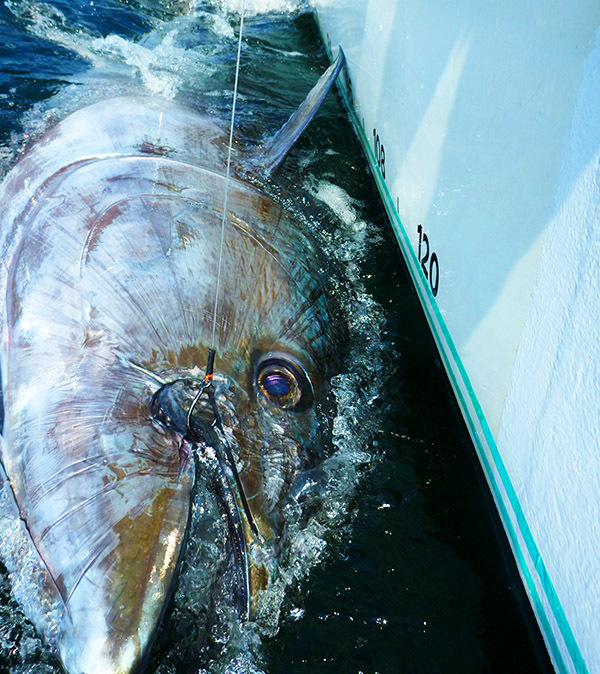 The average tuna in these Canadian waters is between 300 to 1000 pounds. 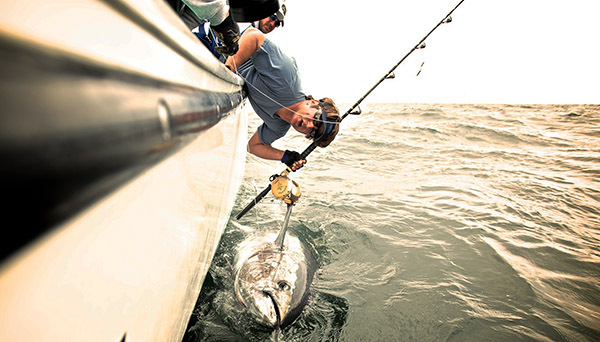 If you’ve caught any of the tuna species, you are aware of their massive strength and endurance. So apply that to a 900 pound specimen and you are going to know you’ve done battle. 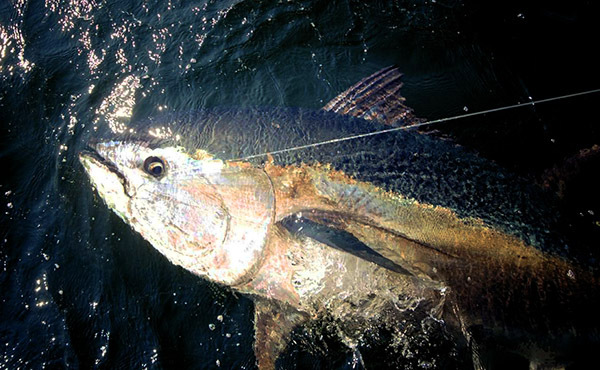 Heavy tackle is the norm and 40 to 60 pounds of drag pressure is used to catch these fish as quickly as possible to ensure they have enough energy left for a healthy release. 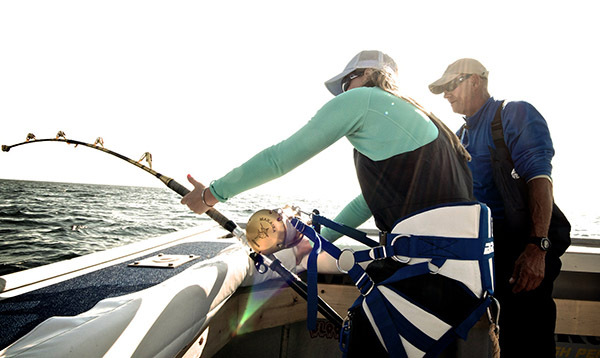 The bluefin fishery in PEI is highly regulated and is almost all catch and release. The boats are allowed to harvest one fish per year, so they naturally hold out for one well over a thousand pounds. They are only allowed to catch and release one tuna per trip, so after the grueling battle, you chug back to the dock where they serve lobster rolls, clams and fresh steamed mussels. 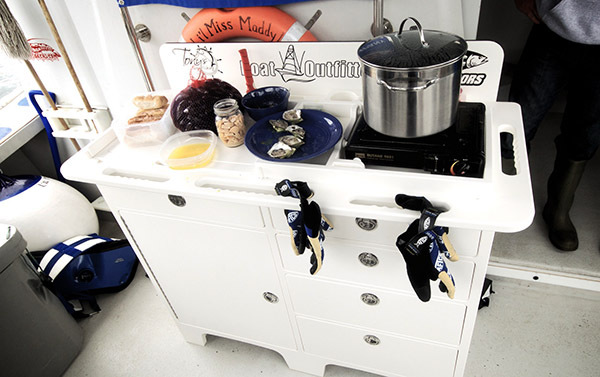 They have an awesome custom tackle center from Boat Outfitters that not only organizes the tackle, but holds the cooking gear. After an hour or two, you head back out for a second “trip” and try to catch one more. The run to the fishing grounds is normally only a couple miles, so you are fishing in no time. 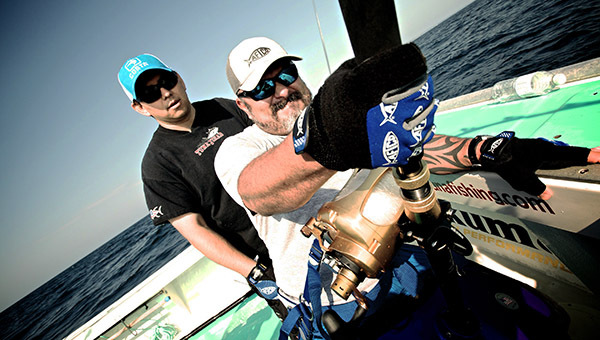 The BD team has been fishing with Tony’s Tuna Fishing for years now. 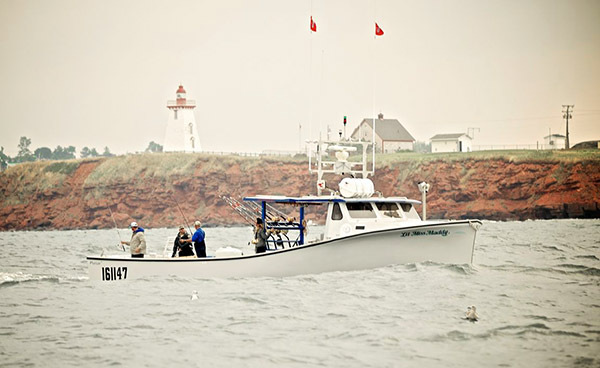 The Race to PEI on BDoutdoors.com is a very popular contest, where one lucky member gets drawn from the thousands who have registered. Jason Hayashi of BD said “this year we had the pleasure of bringing Gilbert Saucedo of California. He fit right in with the crew and was excited to experience this level of fishing”. Gilbert fishes California on the long-range boats and has caught bluefin before, but nothing of this proportion. He got fitted in the stand-up harness and waited for his moment. He didn’t have to wait long when a huge explosion erupted on the closest live mackerel. The 200 pound mono topshot melted off the reel as well as a bunch of the braid backing. It is amazing how these fish can burn line against so much drag. The Okuma 80’s they are using take it in stride everyday of the season. The incredible pressure is a tackle buster for sure. We experienced that aspect first hand on Gilbert’s fish. 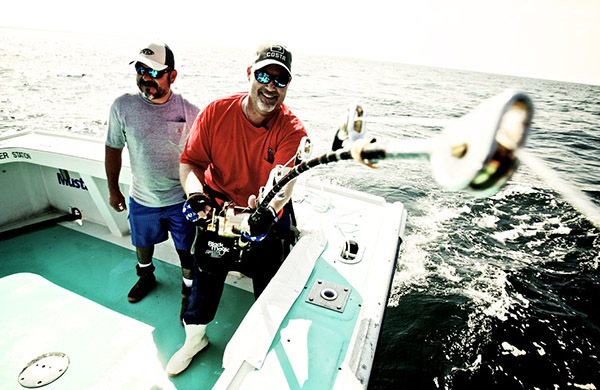 Our video man, Micheal Torbisco, was working his magic capturing the action from every angle when he noticed an unnatural angle in the junction between the rod and reel seat. The rod blank had separated and was about to give out. The true meaning of “team effort” came into play. 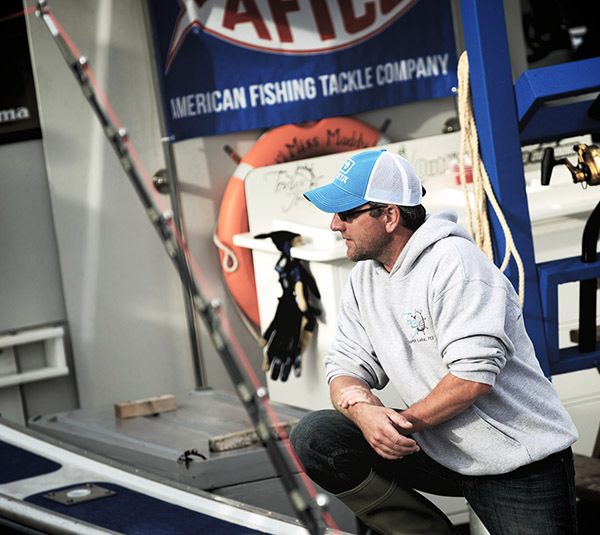 Our deckhand Matt Rose held the rod blank down into the socket, while Capt. Bradley MacDonald quickly peeled the mono topshot off another outfit. We then pulled ahead with the boat and got a little slack. Matt took a few wraps with gloved hands while we spliced the braid with a double uni-knot to the new outfit. We got away with the maneuver and Gilbert continued his battle with this giant. One has to dig deep inside to find the energy and focus to endure the tug of war with something many times larger than oneself. Gilbert never flinched, despite some interesting sounds and grunts of pain. He even spoke some sweet nothings to the fish in Spanish, which seemed to be the turning point of the battle. The leader emerged from the green waters and Matt took hold again and brought the fish boat side. Capt. Bradley used a blunt gaff-like hook to catch the tail and measure the fish along a vinyl ruler on the hull side. 110 inches and huge in girth, Gilbert’s fish was estimated to be around 900 pounds. A few quick pictures and Gilbert had the honor of touching a Bubba Blade to the 200lb Seaguar Florocarbon leader thus releasing this beast to fight another day. Spirits were high as we headed back to the dock for a seafood feast and resetting of the “trip clock”. Gilbert also felt that “fish of a lifetime” feeling. Despite being sore for days, he was glowing with the memory of that accomplishment and the sheer size of the fish. Later that afternoon I had my crack at the reel and the bite was a gentle roll on the surface. Dorsal fins out of the water and a big boil where the bait used to be. That wonderful sound filled the air and the spool was reduced to half in short order. My fish chose to stay near the top for the majority of the fight. There were two heart stopping times when the fish turned towards us and left me reeling as fast as I could while Capt. Bradley eased the Princess Nova in reverse to help take up the slack. Seconds of loose line felt like an eternity, while praying for the line to come tight again. 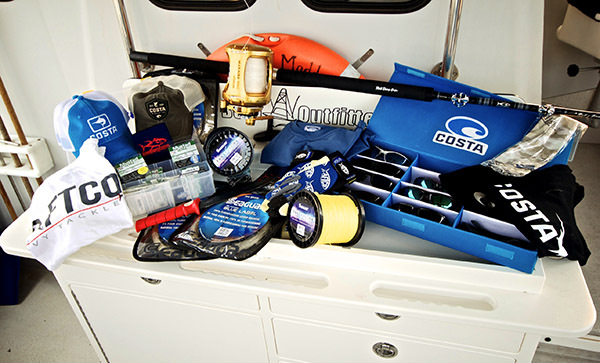 Thanks to the Mustad circle hook, it did and the tug of war resumed. After a 55 minute battle, the fish was showering us with froth alongside the boat. Estimated to be around 800 pounds, it now ranks as my personal biggest fish ever. On the morning of the third day came our final bite and Mikey was set to tackle it. Drawing on his experience from previous years in PEI, he fought his fish like a pro. We did our best to fill his shoes taking video and pictures of him for a change. He was posing with his 550-pound bluefin in less than an hour. Our group also consisted of Larry Dahlberg and Dan Delano from The Hunt for Big Fish and Amanda Perryman with Costa. They fished on Capt. Tony’s boat with BD’s Ali Hussainy, Brant Crenshaw and deckhand Cory Chaisson. They were having good luck too, as Larry and Amanda both did battle multiple times over the course of several days of fishing. They were filming a show for Larry’s Hunt for Big Fish and experimenting with a new rail rod from Salty Dawg Custom Rods in San Diego, California. The island is incredibly scenic and the cooler weather was a welcome change compared to August in Florida. The best part, besides the giant fish, was the hospitality of Capt. Tony and everyone associated with Tony’s Tuna Fishing. His family made us lobster and chicken rolls everyday and went out of their way to make us feel at home. Capt. 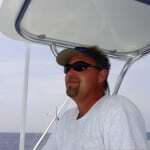 Tony also has rental cottages available to his guests, which have clean, modern accommodations near the marina and the boats. We flew into Charlottetown, PEI and then drove an hour or so to North Lake. The rolling green farmland and the red rocked cliffs create amazing scenery from the road and the water. The water is cool and the weather showed us all aspects from warm and sunny to breezy and cold. Our foul weather gear from Aftco kept us warm and dry, even though it wasn’t raining, the tuna were throwing plenty of white water on us at the boat. We at BD would like to congratulate Gilbert on his winning the contest and the battle with a giant. We thank Capt. Tony and Capt. Bradley, their deckhands and family that worked day and night to ensure that our trip was a success. And thanks also to our industry partners whose great equipment took a beating from a giant so that we could have the “trip of a lifetime”. Check out the Impact Zone for more photos from our trip.